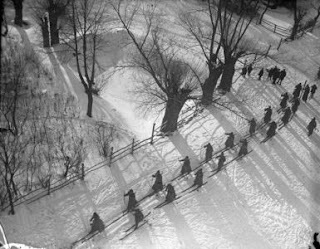 Arkady Shaikhet... Red Army Marching in the Snow (1928, Gelatin silver print). From the exhibition From Pictorialism and Avant-Garde to Socialist Realism: Russian Photography, 1920s-1930s at Nailya Alexander Gallery in New York, NY. "...The 1920s in Russian photography were the most exciting years, an age of great experiments. Photographers from different styles exhibited at major salons both at home and abroad. As in the West, modernist photography was coming into vogue, while the pictorialist movement was still popular with photographers who continued to explore printing techniques and remained faithful to their aesthetic ideals." Lens Culture... Strangers in the Light - photographs by Catherine Balet. "...Strangers in the Light explores the dominance of media screens in contemporary life, from a connected family gathering to a online confessional. Landscapes or interiors, her images also refer to the narcissistic self-awareness expressed on social networks and the new approach to quick, light mobile photography that affects our visual culture. All scenes are lit exclusively with the technological devices generating a mysterious beauty. Balet casts a fascinated, sometimes ironic, eye on the intricate relationship between man and technology, providing a captivating portrait of our society that hovers between fictional and documentary." More... Works by Catherine Balet at her personal site. Robert Frank - From the Pennwick Foundation Collection at Danziger Gallery. "...the first exhibition of Robert Frank photographs from the Pennwick Foundation Collection. Selected from a group of over 1,000 prints acquired in 1978, the works are part of one of the earliest and most comprehensive collections of this most important figure in the history of the medium, focusing on the seminal images created by Frank in London, Paris, and America from 1949 to 1962." BBC Radiophonic Workshop: The Alchemists of Sound (2003) at UbuWeb Film and Video. "...The BBC's Radiophonic Workshop was set up in 1958, born out of a desire to create 'new kinds of sounds'. The Alchemists of Sound looks at this creative group from its inception, through its golden age when it was supplying music and effects for cult classics like Doctor Who, Blake's Seven and Hitchhiker's Guide To The Galaxy, and charts its fading away in 1995 when, due to budget cuts, it was no longer able to survive. There are interviews with composers from the Workshop, as well as musicians and writers who have been inspired by the output. Great archive footage of the Workshop and its machinery is accompanied by excerpts of the, now cult, TV programmes that featured these sounds. Also... Delia Derbyshire Electronic Sound Works (1964-1979). Incredible! 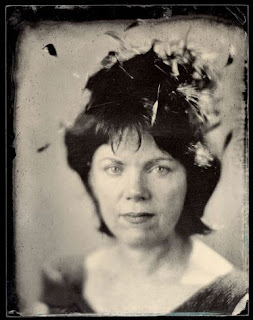 Daniel Carrillo... Rebecca Cummings (2010, Ambrotype). From the exhibition Daniel Carrillo: Ambrotypes at Greg Kucera Gallery in Seattle, WA. More... Works by Daniel Carrillo at his personal site. Elijah Pierce: Wood Carver - a Film by Carolyn Allport (1974, The Ohio State University). "...Elijah Pierce was born the youngest son of a former slave on a Mississippi farm on March 5, 1892. He began carving at an early age when his father gave him his first pocketknife. By age seven, Elijah Pierce began carving little wooden farm animals. Throughout his life, he continued carving animals in earnest and many were sold or given away to people who admired his work or to people he felt could benefit from it. For Pierce, these individual animal carvings each had their own story. They represented the beasts of Genesis or creatures from the folktales of Pierce’s youth." Chris Ware: Building Stories at Carl Hammer Gallery in Chicago, IL. "...In these drawings, Chris Ware imagines the inhabitants of a three-story Chicago apartment building: a 30-something woman who has yet to find someone with whom to spend the rest of her life; a couple, possibly married, who wonder if they can bear each other’s company another minute; and the building’s landlady, an elderly woman who has lived alone for decades. Each drawing details the inner life of these neighbors; their thoughts, ambitions, daydreams, second guesses, and real life interactions are scrutinized and in some cases amplified into seemingly monumental events. In his drawings, Ware speeds and slows time, stops it, and can even seem to run it backward, revisiting and revising recent events, or sideways, incorporating alternative accounts of what’s happening. All this is done with utmost precision. ii For the exhibition, Ware is also producing a special edition of prints that can be assembled to make a model of the building." Also... Building Stories at Adam Baumgold Gallery in New York. Street of Crocodiles (1986, directed by Timothy and Stephen Quay, Flash Video 20:33). "...The Quays’ masterpiece, Street Of Crocodiles is adapted from a short story by Polish writer Bruno Schulz, and was their first film shot on 35mm. A museum keeper spits into the eyepiece of an ancient peep-show and sets the musty machine in motion, plunging the viewer into a nightmarish netherworld of bizarre puppet rituals among the dirt and grime." Innovating Silent Cinema: The Papers of Harry and Roy Aitken at the Wisconsin Center for Film and Theater Research. 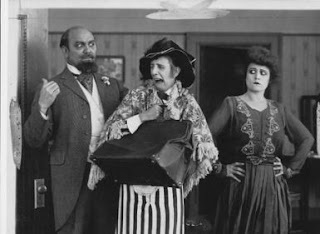 "...The Harry and Roy Aitken Collection contains the papers of two important figures in American cinema of the silent era – and particularly the 1910s. The collection richly documents the production activities of several major studios, units, and filmmakers affiliated with the Aitkens and includes scripts, photos, promotional materials, company ledgers, legal records, and both personal and business correspondence with Hollywood luminaries. Although the collection does not include film prints, it contains paper records relating to some of the United States’ most powerful and well remembered filmmakers, including D.W. Griffith, Mack Sennett, Thomas Ince, and Charlie Chaplin." Wisconsin Silent Movie Moguls: Harry and Roy Aitken. "...The Harry and Roy Aitken gallery showcases photographic stills from silent films produced by the Aitken brothers between 1913 and the early 1920s. The Wisconsin-born brothers were pioneers of the American movie industry. While there are few remaining intact films from the Aitken portfolio, the Wisconsin Historical Society gallery contains a variety of information from about 150 Aitken films. Besides film and publicity stills, there is a selection of scripts, scenarios (stories), synopses, production notes, continuity scripts, title cards, budget information sheets, script location lists, state film board licenses, copyright documents and similar papers relating to movie production. Now 61 film stills and promotional posters are available online and constitute another in a series of photographic galleries within the Wisconsin Historical Society's Wisconsin Historical Images collection." Lens Culture... 7 Rooms - photographs by Rafal Milach. "...Over a period of several years, Polish photographer Rafal Milach accompanied seven young people living in the Russian cities of Moscow, Yekaterinburg and Krasnoyarsk. In intimate pictures, he portrays a generation caught up between the mentality of the old Soviet regime and Russia of the Putin era. In this album, bound in synthetic leather, these snapshots of contemporary Russian life are accompanied by interviews with those portrayed." More... Works by Rafal Milach at his personal site.